The Kardashians are the most influential family in the media, from incredible transformations, secret pregnancies and makeup lines that have taken over the World! The girls are some what chameleons and change their hair according to different events and occasions. But we love it! They give us so much hair inspo and have rocked every look under the sun. So let’s take a look at each of the girls and what look left an impression on us. Lets start with the mother to these beautiful girls… Kris Jenner. Kris has for years showcased this classy crop and shown that this cut is stunning on those more mature in age. This pixie is beautifully wispy and layered with a flattering piecey fringe to keep it looking soft and feminine. 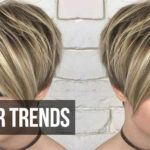 For those with a pixie in order to create this look we would recommend when drying your hair to blast dry it in all different directions to create optimum movement. We would then suggest using straighteners to smooth the hair out and then finishing with a dry wax or texture spray to create that soft piecey effect. Kourtney keeps it sleek and stylish with this stunning high pony that we are all living for! It’s simple and chic and very easy to re create. Here’s how… When drying the hair use a paddle brush to smooth it out. Then go in with straighteners and get it as smooth and straight as possible. Lastly using a bristle brush, brush your hair into a high pony and finish with a shine enhancing hairspray to keep those baby hairs at bay! Kim‘s latest look is this stunning bubblegum pink. Pastel pink is one of those colours that anyone can pull off whatever the skin tone. This spring and summer we are anticipating a lot of pastels and here’s how you can wear it. Wether you have long or short hair you’ll look fab, sleek or tousled. For those wearing it long go for Kim’s middle parting which looks amazing especially when you’ve got roots going on. For those rocking it short go for some messy beachy waves (scroll up to see how to create them). Your guaranteed to wow with these serious boho vibes! Great for festivals. We are in love with Khloe‘s classic LOB. She really helped this cut make it’s debut and here’s why. She keeps this look matt and messy and wears it both sleek and textured. In order to create her look we recommend applying a sea salt spray on wet hair and blast drying the hair dry. Then go in with straighteners and create loose waves. (The trick here is to keep the ends of the curl straight, you can always go back in and straighten the ends after you have created the curl). Once you are happy with your waves give them a spritz with a texture spray (you could use your sea salt spray again) and go around your hair scrunching as you go! This will give you plenty of volume and texture! Kendall is the epitome of sophistication much like her eldest sister Kourtney. This look gives us major inspo and is perfect for a glam night out or special occasion. In order to create this look dry your hair nice and smooth using a brush to dry it backwards, away from the face. Once dry us a comb and hairspray to push your hair away from the face. You could then go back in with your hair dryer and set it into place on a medium heat and speed. Lastly add some shine spray and your good to go! Kylie gave us massive hair envy with this blunt chin grazing bob. The simplicity of it is stunning and easily achieved. Start by drying your hair with a round brush to ensure its bouncy and tucks in around the sides (if you find doing the back difficult then go back in later with straighteners and tuck the ends in). Then use your straighteners if necessary to smooth it all out perfect the ends. Finish with a light serum or shine spray and your good to go! There you have it. The style download and inspo from our favourite group of girls! This post has certainly been Keeping Up With The Kardashians!